Researchers from the University of Southampton, in collaboration with researchers at the University of Quebec at Montreal, have developed a new microsystem for more efficient testing of pharmaceutical drugs to treat diseases such as cystic fibrosis, MG (myasthenia gravis) and epilepsy. A large percentage of pharmaceutical drugs target ion channels, which are proteins found in a cell’s membrane, that play a pivotal role in these serious disorders and that are used to test the effectiveness of new drugs. Ion channels create tiny openings in the membrane for specific ions (atoms that are positively or negatively charged) to pass through. Currently researchers use electrophysiology, which measures an electric current through ion channel proteins, to evaluate the effectiveness of drugs on ion channels. However, this can be a slow and expensive process as it is typically carried out using ion channels in living cell membranes and producing too many channels can actually kill the cells. Now, Southampton researchers have been able to produce an ion channel without using cells, which is possible with so-called cell-free expression mixtures, and to insert the channels in a stable artificial cell membrane which should enable faster, less expensive drug testing. The key is that the cell-free expression mixture, which is known to destabilise these membranes, can actually help with incorporating the produced channels into a membrane between two microdroplets. This combination of molecular biology and microtechnology transformed the conventional multi-day, multi-step single ion-channel electrophysiology method into a quick and economical process. 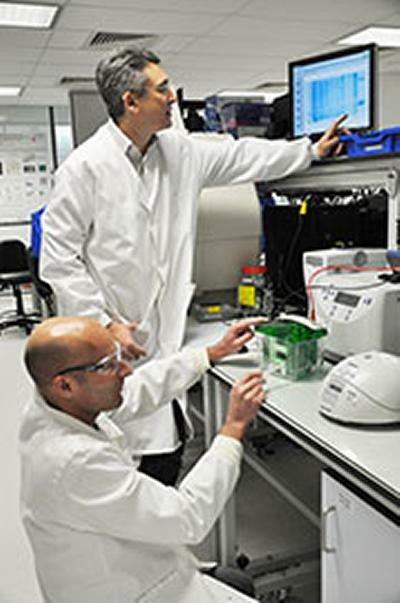 “By putting the ion channel into an artificial membrane, we only have one type of channel, no living cells and a relatively inexpensive method for testing for several of these types of channels at once,” says lead author of the study Dr Maurits de Planque of the Nano Research Group in Electronics and Computer Science at the University of Southampton. The study ‘Single-channel electrophysiology of cell-free expressed ion channels by direct incorporation in lipid bilayers’, which appears in the RSC journal Analyst, is in collaboration with biological scientists in the University’s Institute for Life Sciences. The research has been funded by the Engineering and Physical Sciences Research Council (EPSRC).